We completely restored this 1800's ammunitions store including new asphalt roof and restoration of decorative metal casement windows. 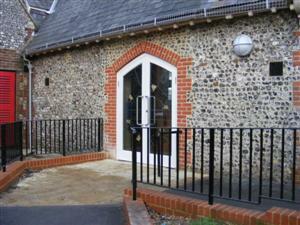 A completed project which involved cutting through a 400mm flint wall. Building a brick arch and sides infilled with salvaged flints. Then a purpose made frame and doors with stained glass were put in place. A wheelchair access ramp and railings were finally added. 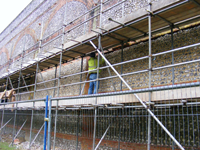 Restoration to a flint curtain wall on one of the original Palmerston Forts. We have now been involved restoring this building for over 30 years, being involved in the original site clearance when the fort was made safe and re-opened to the public. Here are a few examples of the types of work undertaken by B&M Clark Builders. If you would like to discuss some work that you may need doing, then please use the contact us page or call us on 023 92 663643.